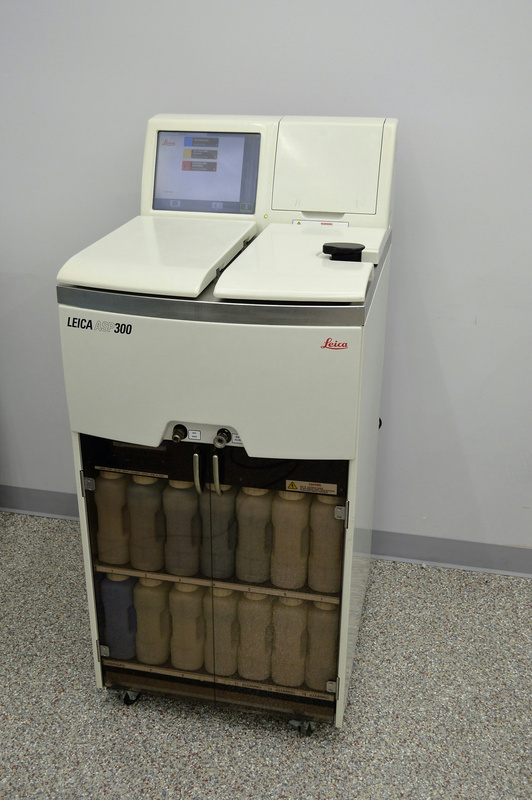 Leica ASP 300 Fully Enclosed Tissue Processor Histology Processing w/ All Jugs . New Life Scientific, Inc. Tested and Functional. Guaranteed by a 90-Day Warranty. This Lecia ASP 300 tissue processor is in very good cosmetic condition, with only some wear from normal use. A New Life Scientific technician who specializes in tissue processing units tested this system and confirmed that it is in good working order. Our technical staff ran several cycles and then flushed the system with xylene and water to dry the lines. All jugs are included with this system. Please refer to the pictures or contact us for more information. Please refer to this brochure for more information on the ASP 300 tissue processor, including specifications and capabilities. The Leica ASP300 is a smart, uniquely automated processor for paraffin infiltration of tissue in routine clinical and research histopathology applications. Proven and enhanced technology with an innovative user interface and smart operating software are the hallmark of the Leica ASP300. Many routine user operations are simplified and the innovative software includes a variety of Smart features to improve sample quality and laboratory economy. The Leica ASP300 is designed to be one of the most reliable instruments available for tissue processing. Smart from the start: The Leica ASP300 represents the latest in engineering and manufacturing technology - the new standard in automated tissue processing.